Abraham Lincoln (February 12, 1809 - April 15, 1865) was the 16th president of the United States, serving from March 1861 until his assassination on April 15th, 1865. Lincoln led the United States through its Civil War - its bloodiest war and its greatest moral, constitutional and political crisis. In doing so, he preserved the Union, abolished slavery, strengthened the federal government, and modernized the economy. Three days before he was shot, Lincoln delivered this, his last public speech. Dealing with "reconstruction", and especially Louisiana, Lincoln for the first time publicly endorsed black voting rights. 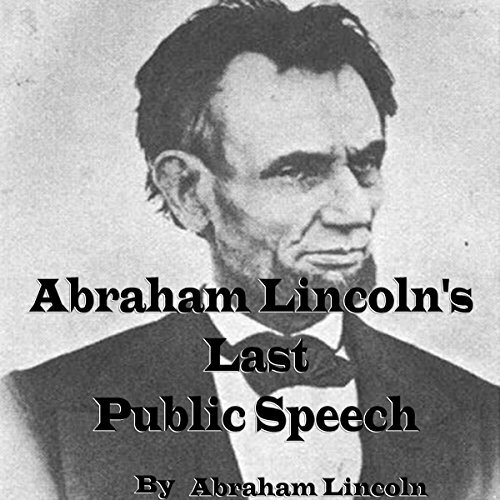 John Wilkes Booth, who was in the audience, vowed "That is the last speech he will make." Three days later he shot Lincoln as he watched a play in Ford's Theatre.